In a statement, Sanders said that he had been informed that Hodgkinson "apparently volunteered on my presidential campaign," adding that, "I am sickened by this despicable act...Violence of any kind is unacceptable in our society and I condemn this action in the strongest possible terms." 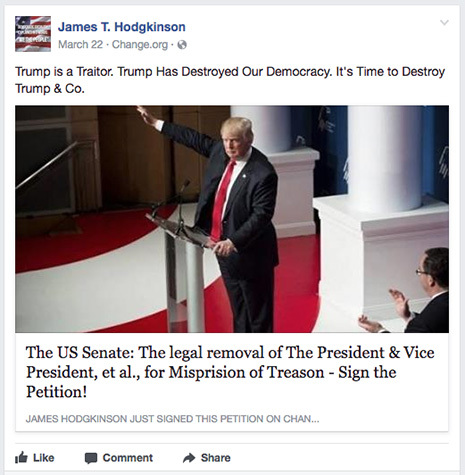 According to Hodgkinson’s Facebook page, he is a member of numerous left-leaning online groups, including The Road To Hell Is Paved With Republicans; Rachel Maddow For President 2020; Sanders For President 2020; Terminate The Republican Party; and Donald Trump is not my President. Hodgkinson, a Belleville, Illinois resident, was killed when police returned fire this morning. According to police reports, Hodgkinson has twice been involved in gun-related matters involving law enforcement. On March 24, a Belleville man called police to report hearing 50 gunshots near his home. Responding officers came across Hodgkinson "in the pine trees." Hodgkinson--who was carrying an Illinois Firearm Owners Identification Card--was advised by cops “not to discharge his weapon in the area” since there were homes nearby. Hodgkinson, who was not arrested, was carrying a hunting rifle, cops say. In 2006, during a family dispute, Hodgkinson allegedly pointed a shotgun at a man who told police that Hodgkinson struck him in the head with the weapon’s wooden stock. As the victim fled, Hodgkinson “shot one round,” police reported. However, “It was unknown at the time of this report if the subject fired the round” at the man “or in the air.” Hodgkinson was arrested for domestic battery and aggravated discharge of a weapon. His rap sheet includes other collars for resisting police, drunk driving, and criminal damage to property. The St. Clair County Sheriff's Department today distributed two mug shots of Hodgkinson, one taken after his 2006 arrest and a December 31, 1992 booking photo. Details of the earlier collar were not provided by police. Hodgkinson has worked as a home inspector. According to his firm's Yelp page, Hodgkinson has operated JTH Inspections since 1994.